Every second year Milan is home to the trade show EuroCucina. It showcases the latest and greatest in kitchen design and technology. So what’s cooking in kitchens (sorry, I couldn’t resist)? Well, the hidden kitchen is evolving. There’s been a growing trend towards bringing together living and kitchen areas with clean lines and stylish details, creating a more sophisticated space. New and creative ways of designing a streamlined, uncluttered space are the next phase in morphing the kitchen from a cooking-and-eating hub to a flexible multitasking space. In the past, the design industry had been treating high-end appliances like trophies (think commercial style ranges and refrigerators) and making them the room's focal point. Now, we are heading in the opposite direction, hiding kitchen bling behind wood panels or underneath counter tops. 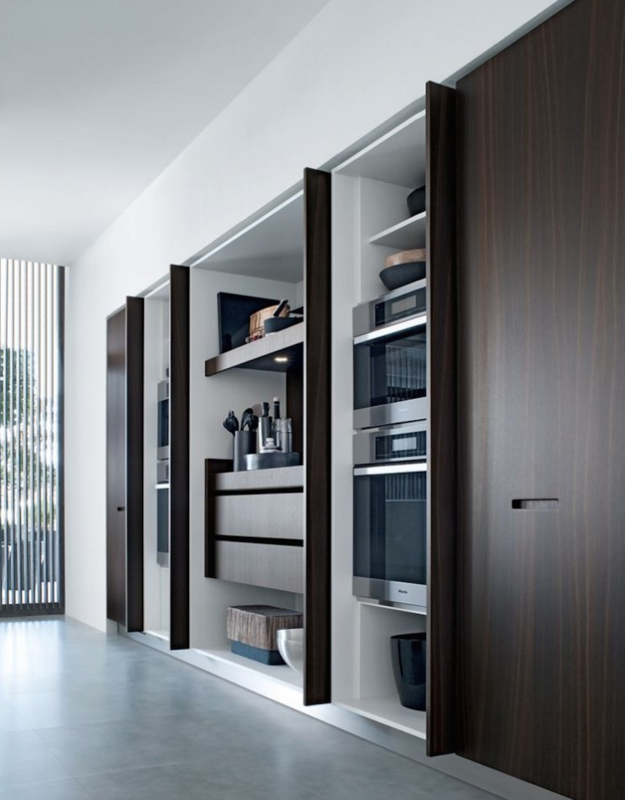 For a few years we have see appliances disguised using panels which creates a clean, airy, sleek feel. The Subzero integrated refrigerator above is “panel-ready" to help it blend seamlessly with cabinetry. 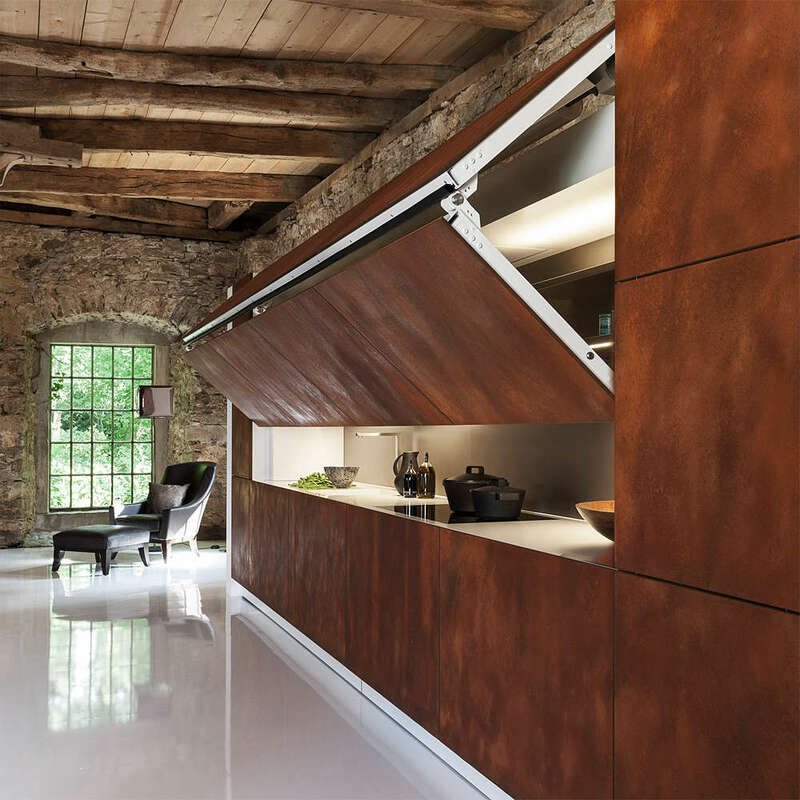 We are seeing inventive ways of hiding work spaces and small appliances using vertical folding doors such as in the kitchen above by Poliform Varenna. Or by using vertical folding doors like these by German company Warendorf . It features an electronic panel that lifts at the push of a button. Let’s not forget the island. Manufacturers are showcasing kitchens with retracting and telescoping counter tops. Take a look at the Atelier collection by Minotticucine. The counter top can be pulled back to reveal a cook-top underneath, a kitchen sink, a pop-up faucet. This trend has been growing worldwide for a while now. It has been quietly creeping into the US market, but it is definitely making an impact and is a sign of things to come.